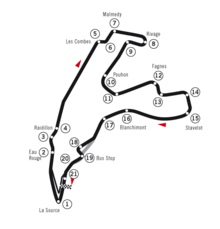 The 1994 Belgian Grand Prix was a Formula One motor race held on 28 August 1994 at the Circuit de Spa-Francorchamps, Spa. It was the eleventh race of the 1994 Formula One World Championship. The 44-lap race was won by Damon Hill, driving a Williams-Renault. After Rubens Barrichello took the first pole position for the Jordan team, Michael Schumacher took the chequered flag in his Benetton-Ford, only to be disqualified due to excessive wear on the wooden skid block underneath his car. Hill was thus awarded the win, his third of the season, with Mika Häkkinen second in a McLaren-Peugeot and Schumacher's teammate Jos Verstappen third. Having deputised for a suspended Mika Häkkinen at McLaren at the previous race in Hungary, Philippe Alliot now returned to his old Larrousse team for this race, taking the place of Olivier Beretta. Meanwhile, the cash-strapped Lotus replaced Alessandro Zanardi with local driver Philippe Adams, who brought significant funding to the team. Following the deaths of Roland Ratzenberger and Ayrton Senna at Imola earlier in the season, a tyre chicane was installed at Eau Rouge to slow the cars. The Friday qualifying session was held in wet but drying conditions. Towards the end of the session, the Jordan cars were sent out on slick tyres, and Rubens Barrichello duly put his car on provisional pole with teammate Eddie Irvine fourth. More rain fell on Saturday, with most of the drivers lapping several seconds slower than the day before, and only Christian Fittipaldi improving his time. Thus, Barrichello took the first pole position of his career and the first for Jordan. Drivers' Championship leader Michael Schumacher was second in his Benetton, with Damon Hill third in his Williams. After Irvine came Jean Alesi in the Ferrari, Jos Verstappen in the second Benetton, David Coulthard in the second Williams and the returning Häkkinen, with Heinz-Harald Frentzen in the Sauber and Pierluigi Martini in the Minardi completing the top ten. In dry conditions, Barrichello led away from Schumacher and a fast-starting Alesi. Schumacher passed Barrichello at Les Combes, and Alesi soon followed, only for his engine to fail on lap 3. With the Jordans struggling to hold on to track position against faster cars, Hill moved into second, ahead of Coulthard and Häkkinen. Coulthard overtook teammate Hill during the first round of pit stops, while Barrichello moved back up to second before making his stop. On lap 19, Schumacher spun at Pouhon but retained the lead; the following lap, Barrichello spun into retirement at the same corner. Martin Brundle moved into fifth in the second McLaren, before himself spinning off on lap 25. When Schumacher and Hill made their second pit stops on lap 28, Coulthard led a lap for the first time in his F1 career. After making his own second stop, he remained ahead of Hill until the Williams team called him in on lap 37 to check his rear wing. He then developed gearbox problems and was passed by Häkkinen, Verstappen and Mark Blundell in the Tyrrell. On lap 40, Coulthard hit the back of Blundell's car going through La Source; both were able to continue, with Coulthard apologising to Blundell afterwards. Though Hill set the fastest lap of the race on lap 41, Schumacher crossed the finish line some 13 seconds ahead, with Häkkinen a further 51 seconds back and Verstappen, Coulthard and Blundell completing the top six. Shortly after the race, excessive wear was found on the wooden skid block on the underside of Schumacher's car. The skid block was a mandatory requirement on all cars, introduced two races before in Germany, to increase ride height and reduce ground effect advantages. Wear on the skid block of up to 1mm was permitted; any greater would make the ride height too low and result in an illegal aerodynamic advantage. The Benetton team claimed that the excessive wear resulted from Schumacher's spin on lap 19, but the stewards rejected the claim because of the wear pattern. Schumacher was thus disqualified and Hill awarded the victory, with Häkkinen second, Verstappen third, Coulthard fourth, Blundell fifth and Gianni Morbidelli sixth in the Footwork. Schumacher's lead over Hill in the Drivers' Championship was reduced to 21 points with five races remaining. ^ "Grand Prix Results: Belgian GP, 1994". GrandPrix.com. Retrieved 7 June 2008. ^ "Belgian GP Friday Qualifying". motorsport.com. Retrieved 2 July 2011. ^ "Belgian GP Saturday Qualifying". motorsport.com. Retrieved 2 July 2011. ^ "1994 Belgian Grand Prix". formula1.com. Archived from the original on 6 November 2014. Retrieved 23 December 2015. ^ a b "Belgium 1994 - Championship • STATS F1". www.statsf1.com. Retrieved 13 March 2019.